A friend shared a video about a little girl preaching and speaking in tongues with me today. I am very excited. Let the little children come to me for such is the kingdom of heaven. When my children were young we would gather at night and pray as a family. We now pray with our four grandchildren who live nearby once a week. They sing and dance and jump about. I am inspired by this video to go further and encourage them to speak in tongues. We make the gospel complicated. We are suspicious of someone who needs God instead of letting the Holy Spirit come and do his work in the person. In our pride we want to control. Is the person good enough? He is an alcoholic. She is a prostitute. I don’t want that person to come into my house. I can’t cope with this. She hurt me. I can’t forgive him. That person should be in a mental home. The devil will attack you. You will get into trouble. What church do you attend? The good news Jesus will deliver you out of every trouble. Psalm 91. He has given his Holy Spirit till the work on earth is done. Do you want to be involved in his work in these days? Get praying in tongues more. Shut off your own thoughts and let the river flow. She is now asking us to pray for her children and extended family and friends. Her young daughter is reading the New Testament every morning. Her sister got healed of a wasting disease and a friend has stopped drinking. The Holy Spirit is doing his work. She continues to speak a few words in Tongues but God’s power is operating. Other powers are at work in our lives. The power of sin, the power of the world and the power of the devil. Gods power is greater than any other power. But Jesus breaks the power of sin and we don’t need to be under its power any longer If we believe that Jesus forgives then receive his forgiveness and freedom. We don’t have to keep on doing the same old habits we can’t break ourselves. Jesus sent Satan running when he died on the cross. The devil was made a spectacle. His power was broken over us. In the name of Jesus we overcome his power. Jesus overcame the power of the world. We no longer need be seduced by its pull on our hearts and minds. Simply by receiving God’s Holy Spirit and praying in tongues we have a weapon to overcome in this world. Receive your promised land! Be like this little child. I am on a break after a busy summer. Time to stop all activity, no housework, cooking, shopping, talking, gardening, phone calls or driving. I have learned if I don’t take a holiday at this time of the year my body will cry out some other way. I will take sick and be confined to bed, or some other circumstance arise to cause me to stop working or giving out emotionally or mentally. As I was enjoying the view of pine trees across from my window, the peace and stillness was broken by the chug, chug of an engine. 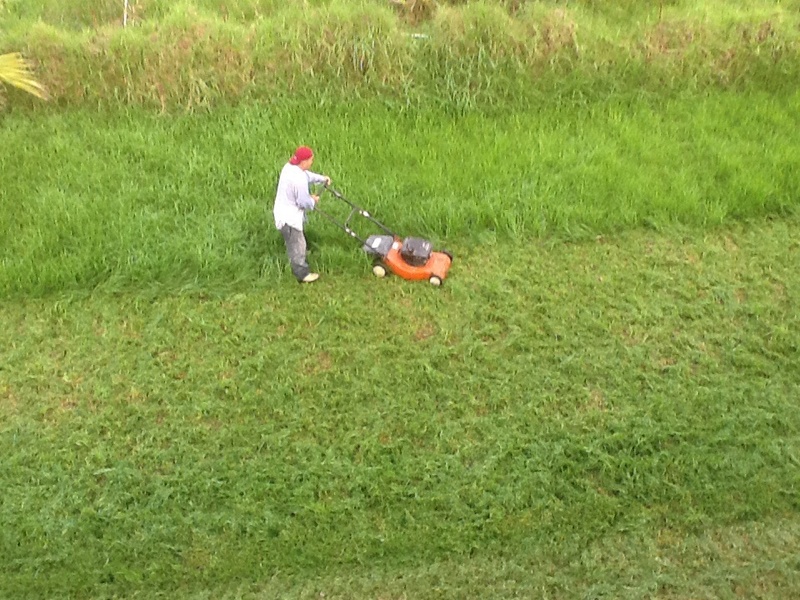 I looked out to see someone mowing the long grass outside. The sound took me back fifteen years. Our family had moved into a big house with a big garden. It was overgrown and had not been cared for. Years of fallen leaves had built up and thorns and briers grew up freely. I knew there would be rich soil underneath all this cover. How was I going to restore this land? I like a challenge and outdoor work. I found a second hand lawnmower in the Ads for Free magazine, just like the one the gardener is using today. It did not cost much but this was a power machine for me over the next years to clear my land. Briers, thorns, old grass and odd refuse were cut to pieces and collected by my machine and I.
I sowed grass seed in the newly cleared ground and before long I had a green lawn. I was not daunted by the overgrown garden. It was a challenge I overcame. I cleared my land of thorns and thistles. Today I am glad to be resting from my labour.